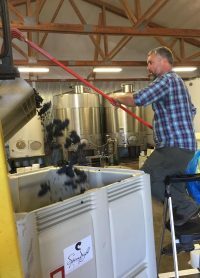 That’s how self starter Matt Compton, who calls himself an “agrarian at heart” describes his experience growing grapes and making wine over the last two decades. Matt is no slouch. 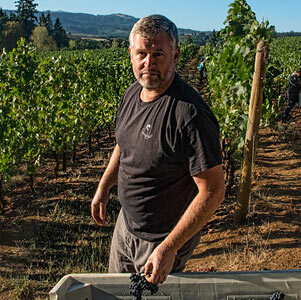 You might call him one of the hardest working men in Oregon’s wine industry – building a thriving business based on his love for farming and a heck of a lot of hard work. Matt and his siblings are the eighth generation of a family deeply rooted in west central New Jersey. Born in 1973, his family had an electrical contracting business and appliance store. But Matt’s father wanted to farm, and in 1980 they moved west to Wisconsin’s dairy country, where they farmed dairy cows. Matt caught the farming bug in Wisconsin, driving a tractor and baling hay at ten years old. The Compton family lived through difficult times in the ‘80s. The dairy industry took a big hit and they lost their farm. Matt’s father worked for other farms, and eventually the family moved back to New Jersey. Matt’s focus in high school was sports—he participated in football, wrestling and Lacrosse—before graduating from high school in 1992. He played football in college for one year. He studied horticulture in college in 1993, looked for land to farm for a time, then took a series of jobs not related to agriculture. The fall of 1995 was a turning point for Matt. He moved to Oregon. In the summer of 1994, Matt took a trip around the country. His friend was going to be starting graduate school at Oregon State University (OSU) in Corvallis, so Matt decided to check it out. Leaving his camping spot in Newport, he visited campus on “a typical May day, a little moist, looking really green, a little overcast.” He was hooked. John sent him to Scott Robbins, a researcher at OSU. Scott suggested that if he became a student he could get a job as a student worker. Matt signed up for school and started working for Scott and other researchers. Scott and Matt connected on the long drives from Corvallis to Woodhall, OSU’s experimental vineyard outside Alpine. On the trips, Scott would talk about the winemaking process and give Matt a one on one course, followed up by the work they would perform after arriving at the vineyard. Scott was Matt’s first mentor in the wine industry. In the winter of 1995, Matt helped Scott plant an apple orchard for cider at the OSU’s Lewis Brown research facility and Scott taught him to graft vines at Woodhall Vineyard. Working at Woodhall, Matt got to know Chris Heider, (720 Cellars) then assistant vineyard manager at Woodhall. Chris decided to finish his graduate studies and Scott Robbins offered Matt the assistant vineyard manager job. Matt’s student status transitioned into a regular job, and in 1996 Matt made his first wine as a home winemaker. For several years, Matt continued to manage Woodhall, make wine, and help out at Lewis Brown Farm, an OSU experimental facility. Matt built a reputation as a talented farmer and in 2000, took his first vineyard manager job beyond Woodhall. 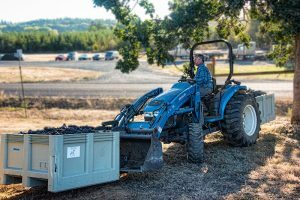 Starting a company called West Vine Farms, he managed Deerhaven Vineyard, delivering the fruit to Willamette Valley Vineyards. Today, Matt still manages the vineyard. When Matt started interviewing for vineyard management jobs at wineries in the North Willamette wine country, he came to a turning point. Was he going to move to the other end of the valley or say put in the Corvallis area? He believed the South Willamette was a better fit for him—more affordable, a place where he could help develop an industry. In addition, in 1996, Matt and Tabitha got together and Tabitha’s family is in the Corvallis area. He interviewed and received the position of Assistant Manager at Benton Lane Winery in 2001, and was promoted to Vineyard Manager in 2002. While working full time at Benton Lane, Matt was also growing his West Vine Farms business, managing vineyards and delivering fruit to local wineries. In 2003, he made his first commercial vintage at 720 Cellars. He had no label name, but wanted to get a wine produced and build a business. In 2004, with friends and family supporting them, Tabitha and Matt founded Small World Wine Company with Jeff and Diane Cyan. The wine he made in 2003 was labeled “Sahalie” and the winery was born. At the same time, the two couples started a wine bar in Corvallis. Speaking of birth, in 2005 the Comptons had their first child—the first of three boys. 2005 must have been the year of no sleep. Matt was working full time at Benton Lane and managing the vineyards at West Vine Farms, while Tabitha was raising a newborn, and both were running the winery and wine bar with the Cyans. Something had to give, and at the end of 2005 they divided Small World with the Cyans. Matt and Tabitha took the winery and the Cyans took the name Sahalie and the wine bar. 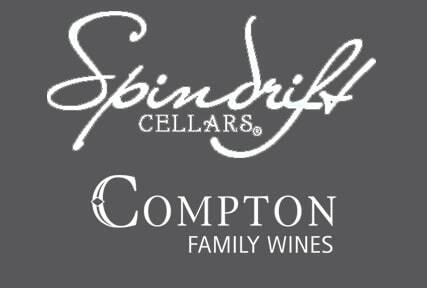 In January of 2006, Matt and Tabitha started Spindrift Cellars and registered the trademark as their new brand. As they built their business, Small World diversified, making wine for private labels and hosting Domaine Meriwether in their facility. Matt got to know Ray Walsh, the winemaker for Domaine Meriwether and owner/winemaker of Capitello Wines. Ray, an experienced winemaker, particularly known for his expertise in white and sparkling wines, became another of Matt’s winemaking mentors. Today Matt sells Pinot Gris grapes to Ray and continues their mentoring friendship. Matt considers himself a farmer first and a winemaker second. To increase his knowledge of winemaking, from 1996 to 2000 Matt took winemaking and viticulture classes while working at OSU (how did he have the time?). “I focused my education on things to achieve my goal for my business, rather than a diploma,” Matt says. 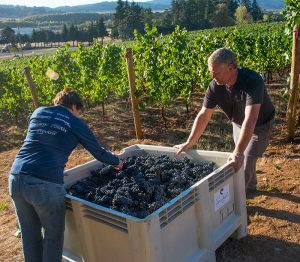 During the first harvest for Spindrift Cellars, Matt made 1,000 cases of wine. By 2015, Matt made 8,000 cases of wine from more than ten different varietals. “We’ve been on a small, steady growth curve,” says Matt. 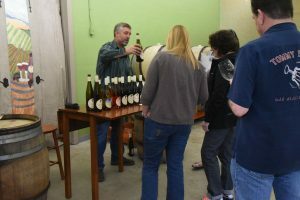 Choosing to offer a wider range of wines in their tasting room than the usual Pinot Noir and Pinot Gris, Matt traveled to Walla Walla for several years to pick up grapes for a Spindrift Syrah. And he traveled to Southern Oregon to purchase additional red varietals. But Matt says his “heart is in Pinot Noir” and plans to scale back the number of varietals Spindrift offers. Matt’s West Vine Farms now only manages the vineyards from which he gets fruit for his Spindrift wines. Matt describes his goals for Spindrift and West Vine Farm: “We’d like to increase the market return at the size we are at. 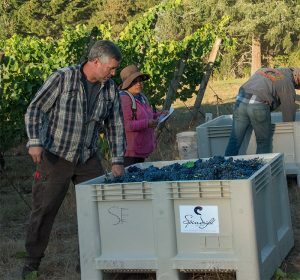 We’d like to establish a reputation that gives us the best return, not worrying about managing on a cash basis but making a really good wine that gives us stability as we move forward”. Going forward, Matt plans to stay at 8,000–10,000 cases and to focus on making wines that are blended from several vineyards. are not climbing the barrels or skating through the facility. The future? With Matt’s focus and drive, this “agrarian at heart” seems destined for a long and successful career, with plenty of tractor driving along the way.